A version of the Russian folk tale by Alisa Matyunina. The girl in a blue dress with a long dark braid of hair, waved to her parents as the cart, which rocked with the large sacks of flour, carried them out of sight. She then took her brother’s hand and led him into the yard so that everyone could see that she was going to keep her promise and look after him. Masha was true to her word for most of the day and never left Vanya’s side, but when the sun began to set, and the other girls and boys were playing in the river she couldn’t resist and, leaving Vanya to play in the yard, she ran to the river, releasing her hair to fall on to her shoulders. The sun burned in the sky in bright crimson flames before extinguishing in the horizon. By this time Masha was sitting plaiting her wet hair and singing by the fire. Then several dark shapes flew out of the trees. When they passed over her head, in the light from the fire, Masha noticed that they were in fact white birds, their elegant wispy bodies gliding over the roofs of the village, only the red flash on the end of their dark beaks, disturbed their sleek silent movements. Masha reached their locked gate, her cheeks red with excitement. Everything was still and a few little figures of animals were formed in the sand and a familiar half empty bucket lay on its side. As Masha searched for her little brother, only a single white feather floated to the ground. The girl’s eyes turned to the forest, in the middle of which stood a hut on four withered chicken legs where an old woman lived. Many stories went around about their inhabitant, but no one in their village had ever dared to test them. But Masha knew for sure, that it was Baba Yaga who had taken her brother. She ran to the end of the village. Masha had only dared to venture outside its borders once, and when she did again, she felt as though as a spell had been broken and she had stepped out of the circle that had protected her and all those around her, that is, until that day. As she ran, the branches reached out with their shrunken and cracked hands, seizing and snatching at her clothes and face. And then, someone seemed to call out to her, a desperate cry that shook the forest. A wild deer raced past her, and tripping on a root, she fell. Her dress torn, arms cut and grazed, she collapsed into the trunk of the tree, her whole body convulsing with heart-wrenching sobs. “Don’t cry, dear. Help to take the weight off my shoulders by shaking off my apples.” Masha raised her head. She had not heard the tree and continued on her way, her undone plaits whipping her face. But she didn’t stop, and penetrated further and further into the forest, and finally, she could make out the small wooden house, no more than a reclusive light dancing in the distance. The girl reached a small rapidly flowing river, where the water was gushing white, pouring over a heap of obstructing rocks. “Please,” the river called. Masha stopped. “I can’t – I need to save my brother.” And with that she turned away. Masha stepped up to the house. 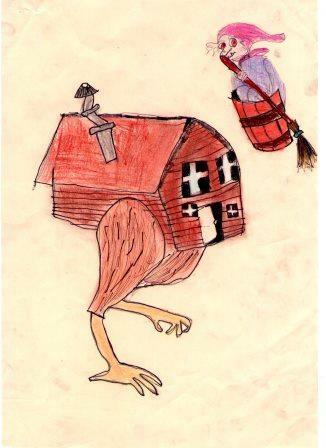 The giant withered chicken legs had raised the house so that Masha could only just reach to the window. She tapped at it with her fingers, and Vanya peeped out. He looked at the old woman in the hut, hunched over, whispering something over her stove which was omitting sudden bursts of yellow sparks, and he slipped out of the window into Masha’s arms. “She was going to put me in the stove,” Vanya panted as they ran from the hut. “And those birds, their wings are as soft as swans’ but their voices and their beaks are more like geese’s. They kept dropping me and plucking at my skin.” He raised his shirt to reveal his back which was covered with purple creases. They reached the river; the gush of spray had been replaced by a little stream of water. It looked tired and the rocks seemed more like boulders placed by giants on a white sheet. Masha stopped, and they moved them away. At once, water began to flow and a rush of life came over the river. Masha and Vanya had only taken a few steps, when they heard an ear-splitting cry overhead. Baba Yaga was storming towards them in her hut, the chicken legs racing towards them. “Don’t worry,” the river said. “the hut can’t cross my banks.” The children ran, and soon they lost the sound of the witch’s shrieks. Masha’s legs were swaying underneath her, and just as she was about to put Vanya down and sit on a large tree stump, they heard her again. She was flying in a large mortar, and was sweeping her way through the sky with a broom. Her burning eyes ignited when she saw the frightened children, her mouth twisting into an insane laugh. Masha rushed to the great stove which was standing a few feet from them. “Shield us!” She cried. The fumes seemed to blow in the direction of a pile of wood that lay next to it and the children dived into it. Emerging tentatively, they made their way from the stove, but after taking only a few steps, Masha returned and, using the ribbon that held her tattered plait, opened the stove door and released the smoke building up inside. The stove stopped puffing and gasping, and smiled at the children, offering both of them a bun. Masha picked up Vanya, whose little feet were staggering underneath him, and carried him further through the forest. How do you imagine Baba Yaga to look? Draw some more illustrations for this story, including Masha and Vanya, the birds, the tree, or any other element of the story. In 2015 we held a competition and you can see some of the winning drawings on Baba Yaga and the Firebird. ​What would happen if Masha hadn’t made it in time? Would Vanya have run away by himself and would the forest have helped him? See if you can write your own story using some of the characters in "White Birds".